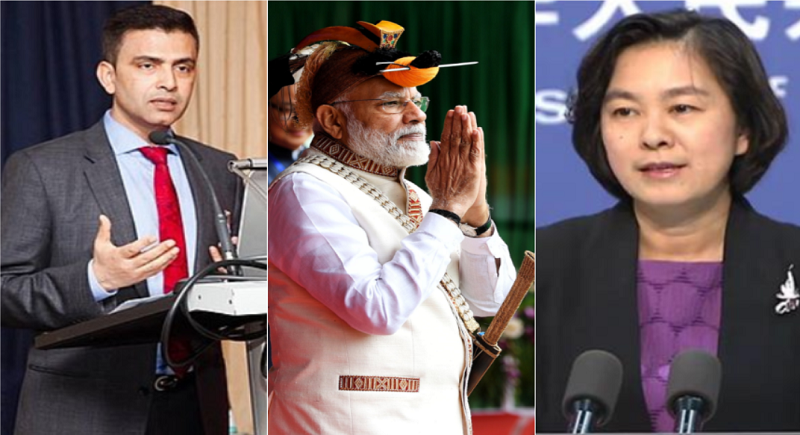 New Delhi, February 9: The Indian Government has rubbed off the China’a objection over the Prime Minister’s visit to Arunachal Pradesh saying that the state of Arunachal Pradesh is an integral part of India. "Indian leaders visit Arunachal Pradesh from time to time, as they visit other parts of India. This consistent position has been conveyed to the Chinese side on several occasions”, added the MEA spokesperson Raveesh Kumar in response to a media query on Chinese MFA’s statement, earlier in the morning. The Chinese spokesperson Hua Chunying had remarked on Modi's visit to the East Section of the China-India Boundary saying that China's position on the India-China boundary issue is consistent and clear-cut. “The Chinese government has never recognized the so-called Arunachal Pradesh and is firmly opposed to the Indian leader's visit to the East Section of the China-India boundary”, she said in relation. “China urges the Indian side to bear in mind the common interests of the two countries, respect the interests and concerns of the Chinese side, cherish the momentum of improvement in bilateral relations, and refrain from any action that may lead to the escalation of disputes or complicate the boundary question”, she added further. Prime Minister Modi on Saturday inaugurated and laid the foundation stone of projects in Arunachal Pradesh worth over Rs 4,000 crore and said his government was giving a lot of importance to improve connectivity in the border state. Modi said his government was giving importance to improve the highway, railway, airway and power situation in Arunachal Pradesh, which was neglected by the previous governments. China claims the north-eastern Indian state of Arunachal Pradesh as part of southern Tibet. India and China have so far held 21 rounds of talks to resolve the border dispute. The India-China border dispute covers the 3,488-km-long Line of Actual Control (LAC). China routinely objects to Indian leaders visiting Arunachal Pradesh to highlight its stand. However, New Delhi and Beijing have tried to repair the damage and the ties have been on the upswing after Modi and Xi had an icebreaking meet last year. Both the leaders pledged to keep the border quiet and peaceful.